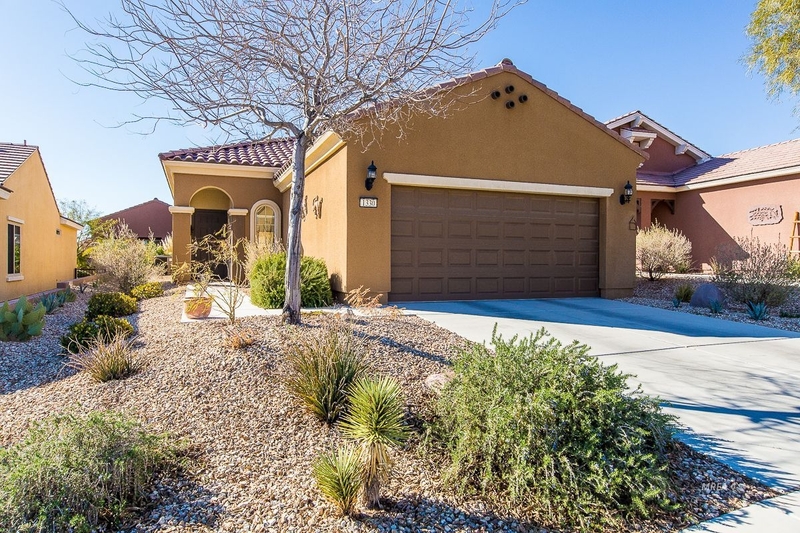 This bright open Daisy floor plan is located in the Water Barrel Village in Sun City Mesquite. Not wanting to wait 8 months for a New Sun City Home to be built? This is your answer. This home has upgraded features such as extended tile flooring, window coverings and granite counter tops to name a few. Kitchen Cabinets have pull out shelves and all the stainless appliances stay including the refrigerator. Tiled main living areas are a nice upgrade. The great room is spacious with a picture window and sliding glass door out to the patio. The back patio has been extended with a covered Pergola and Pavers. New Water Softener and Irrigation Control Box. Ready for you to start enjoying your quiet peaceful backyard. Sun City offers resort-style amenities and 55+ active lifestyle w/18-hole putting course, tennis, pickle ball & bocce courts, 30,000 SF clubhouse has billiards rm, state-of-the-art gym, aerobics studio, indoor pool & spas, indoor walking track. classes &100 clubs. Resident discount at Conestoga Golf Course & 1880 Grille. Seller is offering a $3,700 Exterior Paint Allowance.